While reading some news this morning, I came across to this interesting war issue between Iran vs. Israel and United States. Just recently, Iran has been preparing hard to defend themselves against any attack by the U.S. or Israel. They test-fired long range missiles to show they are not scared but equipped with weapons that have special capabilities. Meanwhile, United States warned Iran that they will not back down in the face of threats against Israel, and they are ready to defend American interests and the interests of their allies. 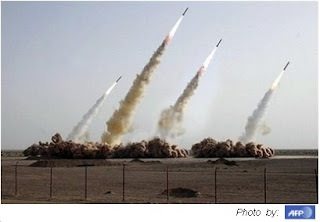 Iran's preparations for war are well underway with their Shahab-3B missiles positioning to aim right for the nuclear heart of Israel. However, President Bush has approved the linking of Israel to a US infrared satellite detection system that could spot Shahab missile launches within seconds. This should enable the Israeli air force to destroy such missiles in the booster stage. The system will also give the Israelis about 15 minutes to seek shelter before any warhead hits. Looks like war is unavoidable at this point. Lets pray for peace and harmony in this world, like what I always say, life is to short to fight each other. Let's fasten our seat belts!